Tantalizing Trademarks™: Recent Trademark Application for LIL MAYO Covers "Personal Appearances by a Fictitious Alien Character"
Recent Trademark Application for LIL MAYO Covers "Personal Appearances by a Fictitious Alien Character"
Just last week I blogged about a recent application to register the name of the popular BOOP MY NOSE Instagram account as a trademark with the U.S. Patent and Trademark Office. A couple days later, another popular Instagram account filed an application to register the account's name as a trademark - LIL MAYO. Is this a new trend? According to the application, LIL MAYO has been used as a trademark in conjunction with these services since April 21, 2015. Side note - typically the USPTO does not favor an applicant using its own trademark in the identification of goods and services (LIL MAYO, in this case), so the applicant may be required to delete "LIL MAYO" from the identification of services before this mark can register (assuming there are no other issues). TMEP 1402.09. Earlier this year, the same individual that filed this application filed another application for LIL MAYO covering "t-shirts." However, the USPTO issued an Office action refusing to register that trademark due to a likelihood of confusion with an existing registration for MAYO owned by the Mayo Foundation for Medical Education and Research that also covers various clothing items, including t-shirts. The applicant will have a chance to respond to the refusal, but has not yet done so. 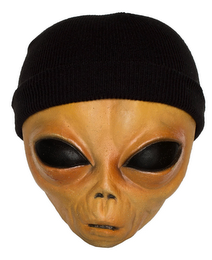 Additionally, this individual owns a pending application for the alien head logo seen below that covers "hats" and "t-shirts." That application will be published for opposition on August 14, 2018 - the final phase of the registration process for a trademark that is already in use. See TMEP 1502. As of the date of this post, the Lil Mayo Instagram account is a verified account with 1.8 million followers and consists primarily of photographs and videos of a little alien doing all sorts of wild stuff (as the Instagram post above from the account demonstrates).